The Robert Koch Institute, is a German federal government agency and research institute responsible for disease control and prevention. It is located in Berlinand Wernigerode. It was founded in 1891 and is named for its founding director, the founder of modern bacteriology Robert Koch. The Institute prepares a report on cancer in Germany every two years. The institute also plays a role in advising the German government on outbreaks, such as the 2009 swine flu outbreak. Dec 10th is an important day ~ for since 1901, the Nobel Prizes have been presented to the Laureates at ceremonies on this day, the anniversary of Alfred Nobel's death. As stipulated in the will of the Swedish-born inventor and international industrialist Alfred Nobel, which was opened after his death in 1896, the Nobel Prizes in Physics, Chemistry, Physiology or Medicine and Literature are awarded in Stockholm, Sweden, while the Nobel Peace Prize is awarded in Oslo, Norway. Since 1969 an additional prize has been awarded at the ceremony in Stockholm, The Sveriges Riksbank Prize in Economic Sciences in Memory of Alfred Nobel, which was established in 1968 on the occasion of the Riksbank's 300th anniversary. The Prize Award Ceremony in Stockholm has, almost without exception, taken place at the Stockholm Concert Hall (Stockholms Konserthus) since 1926. At the Prize Award Ceremony in Stockholm, presentation speeches extoll the Laureates and their discovery or work, after which His Majesty the King of Sweden hands each Laureate a diploma and a medal. 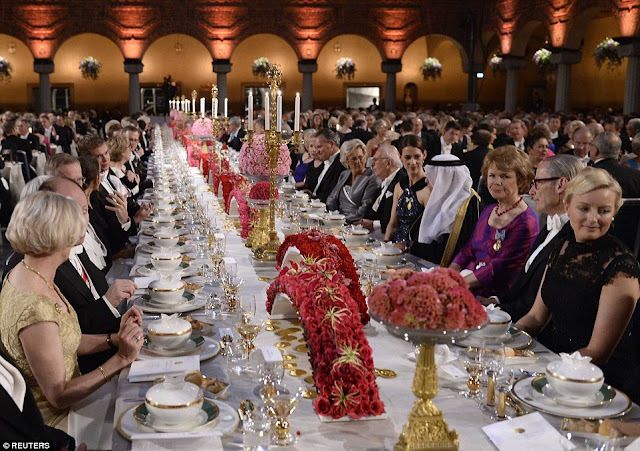 The Ceremony is followed by a banquet at the Stockholm City Hall (Stockholms Stadshus) for about 1,300 people, including 250 students. In addition to the Nobel Laureates and their families, Their Majesties the King and Queen and other members of the Royal Family of Sweden are guests of honour at both the Prize Award Ceremony and the Banquet. Representatives of the Swedish Government and Parliament also participate. 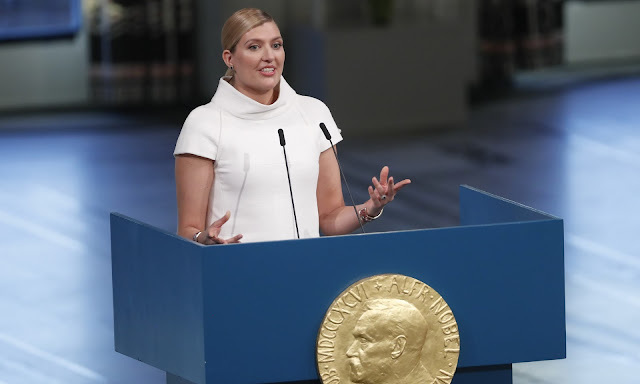 In Oslo the Nobel Peace Prize is presented by the Chairman of the Norwegian Nobel Committee in the presence of Their Majesties the King and Queen of Norway, the Government, Storting representatives and an invited audience. Tensions on the Korean peninsula have spiralled as Pyongyang has in recent months ramped up its number of missiles and nuclear tests. North Korea’s leader Kim Jong-Un and Donald Trump have taunted each other in recent months, with the US President pejoratively dubbing his rival “Little Rocket Man” and a “sick puppy”. ICAN, a coalition of hundreds of NGOs around the world, has worked for a treaty banning nuclear weapons which was adopted in July by 122 countries. The text was weakened by the absence of the nine nuclear powers among the signatories. In an apparent snub of the ICAN-backed treaty, the three western nuclear powers - the US, France and Britain - broke with tradition by sending second-ranking diplomats rather than their ambassadors to Sunday’s ceremony. Several survivors of the Hiroshima and Nagasaki nuclear bombings, which killed more than 220,000 people 72 years ago, attended the ceremony in Oslo. One of them, Setsuko Thurlow, received the Nobel on behalf of ICAN jointly with Fihn. On 10th Dec 2017, Google is honoured the scientist who spent his life studying germs and how they cause infectious disease. On Sunday, Google transformed its logo into a tribute for Robert Koch, who received the Nobel Prize on this day in 1905. As Google explains, Koch identified the bacterium for diseases including anthrax, cholera and tuberculosis. Koch is also credited with sparking a "Golden Age of bacteriology," during which scientists discovered the causes behind 21 diseases. "Perhaps better than anyone else at the time, Koch understood that sometimes the keys to solving big problems lay in their microcosms," wrote Google in a blog post explaining Sunday's doodle. The doodle features potato slices, used by Koch as part of his research. The doodle also features a Petri dish with Koch's name. According to Google, Julius Petri, its inventor, worked as Koch's assistant. Koch died in 1910, five years after receiving the Nobel, according to a biography on the Nobel Prize website. It is a good post. The pictures uploaded are awesome. Congratulations to the those who won prices thank you for sharing this wonderful post with all of us.